Timber harvesting activities are subject to the Commonwealth's Chapter 102 (Erosion and Sediment Control) regulations. An effort must be made to minimize sedimentation from disturbed areas (landings, access and haul roads, stream and wetland crossings, etc.) into waterways- by site considerations and treatment measures to remove or filter sediment from stormwater runoff. A written plan identifying disturbed areas and outlining measures (BMPs or Best Management Practices) that will be installed to treat runoff before leaving the site, as well as details for stabilizing all disturbed areas once complete, is required to be on site at all times until activities are complete. The documents below will assist with planning considerations, and the "E&S plan for a Timber Harvest Operation" may be completed and used to meet this requirement. Be sure to provide a site sketch or map of the harvest/total site boundaries with all planned disturbances sketched out and include with the written E&S plan to make it complete. 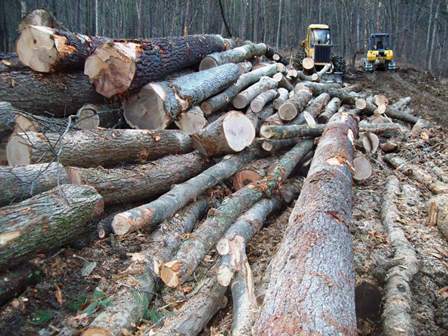 Considerations for timber harvest or logging operations should include locating haul roads, landings and skid trails in locations away from streams and wetlands. Controls to "shed" water from these areas, especially where roads and trails are in steep locations, should be installed and maintained during active operations. When wetlands and streams cannot be avoided or need to be crossed, stream or wetland permits/authorizations (Chapter 105 permits) may need to be obtained. The following PA Department of Environmental Protection documents provide more information to keep in mind when planning and operating such sites. PA DEP Erosion and Sediment Pollution Control Manual, March 2012, Chapter 14 (page 294).